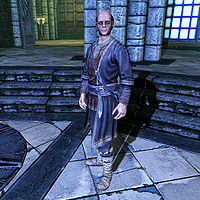 Phinis Gestor is a Breton conjurer at the College of Winterhold, and an expert-level trainer in Conjuration. When your conjuration skill reaches level 90, Phinis offers a quest that, when completed, rewards you with the Flame Thrall spell. This is equivalent to the Conjure Flame Atronach spell, except that the conjured ally materializes permanently instead of temporarily. He sleeps every night between midnight and 7am in his room on the ground floor of the Hall of Countenance. After waking, he spends the morning in his room eating, relaxing, or wandering around it. At noon he enters the Arcanaeum where he remains for ten hours. At 10pm he will either wander the Hall of Attainment or return to his room to relax or go to bed. He wears master robes of Conjuration and a pair of boots. As a conjurer he knows the Conjure Flame Atronach and Conjure Frost Atronach spells, along with a few spells from other schools, specifically Ice Spike, Ice Storm, Stoneflesh, Steadfast Ward, and Fast Healing. If you ask about conjurers outside the College, he mentions his ex-mentor Falion, the master level Conjuration trainer. Phinis will also mention some missing apprentices: Yisra, Rundi, Borvir, and Ilas-Tei. You can search for them, but they are all dead and have no related quests. These should not be confused with the "missing students" mentioned in the Midden Incident Report found in The Midden Dark - the incident report mentions a different Archmage than Savos Aren, and can be presumed to have occurred no less than centuries before. Conjuration Ritual Spell: Find a Sigil Stone by summoning a daedra and learn more about Conjuration. This is the merchandise found in Phinis' merchant chest. These items are only available if purchased from the merchant; they cannot be pickpocketed or stolen. They are restocked every two days. Phinis Gestor also appears on the Conjuration Tutor card in Legends. This page was last modified on 28 February 2019, at 07:05.